PAN Scholarship National Pan-Hellenic Council , Lake Charles Chapter worth $1000. Due date is April 26. CITGO is pleased to announce we are accepting applications for the 2019 CITGO Innovation Scholars Program. The deadline for submission is Monday, April 15. Be a high school senior from a high school in Calcasieu Parish School Board district. Be planning to enroll in full-time study at one of the designated 2-year or 4-year colleges or university for the entire 2019-2020 academic year (see link below for list). Considering a career in the energy industry. TheOppUAchieversScholarshipprovides$2,500 to high-achieving students for tuition costs. To apply, submit as hortresponseatopploans.com/scholarship. The Scholarship is awarded four times a year, with submission deadlines on September30,December31,March31,andJune30. To be eligible ,students must be a U.S.citizen and have a GPA of at least3.0/4.0. 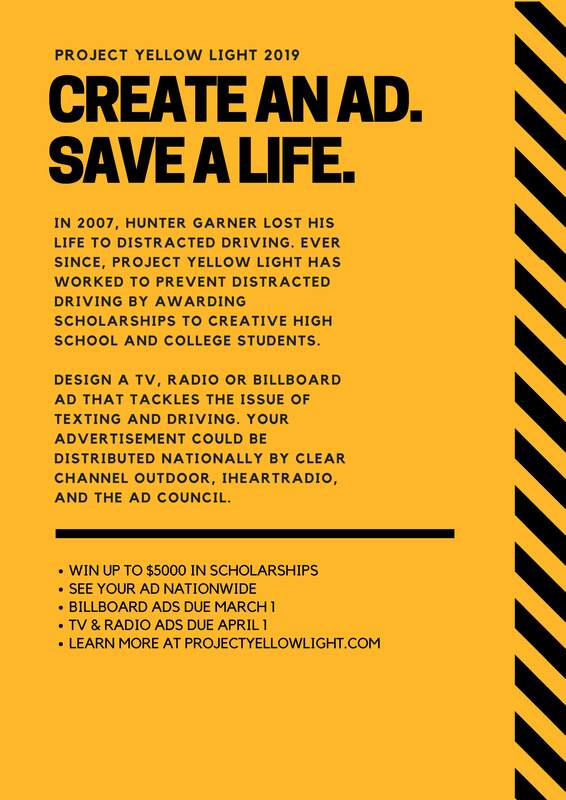 Submissions are now open for Project Yellow Light, an annual PSA (public service advertisement) scholarship competition that seeks to prevent texting while driving. The project was created by the family of Hunter Garner to honor his memory after his death in a car crash at age 16. Submissions are due March 1 for the billboard design competition and April 1 for the radio and video competitions. 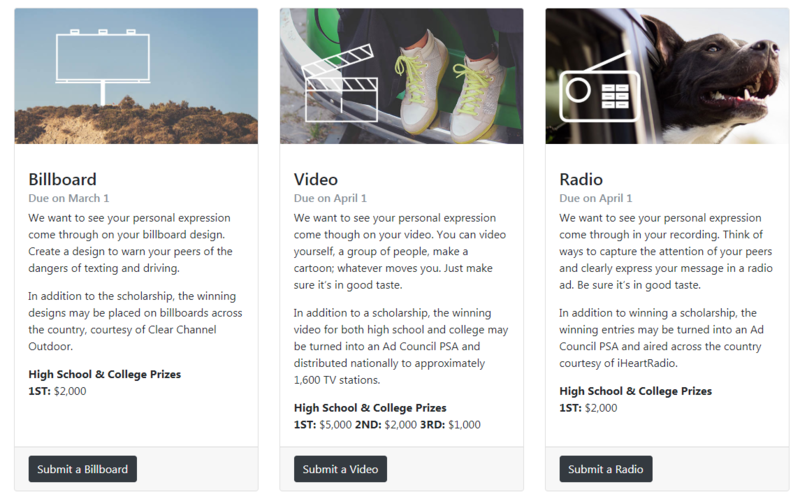 Winning submissions may be distributed as PSAs on television, billboards, and radio stations across the country. In addition to seeing their creative work distributed across media outlets nationwide, winners also receive scholarship money. Project Yellow Light helps teens and young adults reach their peers with a potentially lifesaving message. In 2016, nearly one in ten teen drivers involved in fatal crashes were reported as being distracted at the time of the crash. Students interested in more information should visit ProjectYellowLight.com for official rules, scholarship award information, submission guidelines, and tips and resources. High school juniors and seniors and college students are eligible to submit. Create and wear your original and unique promwear using Duck tape for a chance to win Scholarships or prizes. December Scholarships Click to view. The BURGER KING℠ Scholars program assists employees, employees' spouses or domestic partners, employees' children and high school seniors in the United States, Puerto Rico and Canada in continuing their education. To date, the program has awarded more than $35 million in scholarships to more than 33,000 students. Last year alone, $3.7 million in scholarships were awarded to more than 3,400 deserving students. Integrity, high standards, entrepreneurial spirit, good citizenship and education were the values that defined BURGER KING® brand co-founder James W. McLamore. It was those values that helped realize a dream and it is those same values that are the core of the BURGER KING McLAMORE℠ Foundation, which will continue to build on his legacy and his commitment to education. Delta Sigma Theta Scholarship $4000, 3.0 GPA required, Application available in Counselor's office. "B. Davis Scholarship": Please visit the website http://www.studentawardsearch.com/scholarships.htm to read about details and to apply for this scholarship. Amount $1000.00. Deadline: May 24, 2019. 15 Scholarship Programs available to Louisiana students. These scholarship opportunities are available through a newsletter from StudentScholarships.org. Click on the following link to sign up for the newsletter Student Scholarships Newsletter. 2019 AFL-CIO Scholarship: The Louisiana AFL-CIO will be awarding three $1000 scholarships. To be eligible to enter this essay contest, all contestants must have a parent/step-parent who is a member of an affiliated local union in good standing with the Louisiana AFL-CIO. Please click the following link for details and the application process AFL-CIO Scholarship. Deadline: Must be postmarked by Jan. 11, 2019.
AES ENGINEERING SCHOLARSHIP 2018: This scholarship is awarded on the basis of character, as determined by an evaluation of the essays that are submitted. Submit essay to scholarships@aesengineers.com. Deadline is Oct. 6th, 2018. Click on the following link for McNeese State University Scholarship Info: MSU Scholarships Flyer. Notice: Awarding for scholarships begin on Oct. 1st. First Priority Deadline is November 15th. To apply for a scholarship, complete the Application for Admission & Scholarships online at mcneese.edu/apply. HORATIO ALGER SCHOLARSHIP: The Horatio Alger Association scholarship program provides financial assistance to students throughout the nation who have significant financial need and have exhibited integrity and perseverance in overcoming personal adversity. The scholarships are given to deserving students each year and range in award value from $6,000 to $25,000. Eligibility criteria include: high school graduation in spring/summer, demonstrated critical financial need ($55,000 or lower adjusted gross family income), minimum GPA of a 2.0, and United States citizenship. Students may apply online at scholars.horatioalger.org. Please note: In order for an application to be consider complete the applicant's counselor must complete a Certification Form online. More details for the scholarship are available through the following link: Horatio Alger Scholarship Application Information. You will need Mrs. Winn's email: tracey.winn@cpsb.org. DEADLINE IS OCTOBER 25, 2018. REGISTER FOR LELA'S $1000 Monthly Scholarship Drawing at askLela.org by completing the FAFSA. The Louisiana Education Loan Authority (Lela) is Louisiana's non-profit resource for free FAFSA completion and college access. Click on the following link for access to Lela's FAFSA Guide for the Class of 2019. MCNEESE STATE UNIVERSITY- MUSIC SCHOLARSHIP & ENTRANCE AUDITIONS: Nov. 10-Marching Band, Choir & All Music Majors, Feb. 22- Choir & Vocal Music Majors, Feb. 23- Marching Band, Choir & All Music Majors. For details or to Schedule an Audition: Text AUDITIONS to 337-350-3022.